For users of Nokia Lumia series phones running on Windows OS are facing a problem regarding Outlook or the earlier Hotmail where new mails are not being updated and when users are opening their mails the error which is shown in the image below – Error Code: 85010014 is being shown. 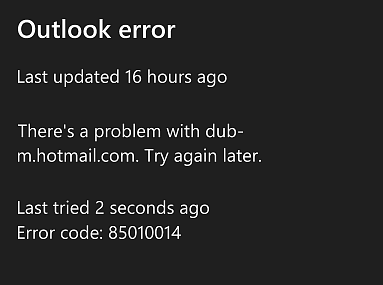 This Error code is seen by many Windows OS users with Lumia 520, 525, 720, 920, 1020 etc when they are trying to access Outlook. If you are seeing any other links in that place do change it to m.hotmail.com and then save the settings and go back and try to login again. If you are getting the same error code again then try the next step which we have given which has solved the issue for many users. You might get “Your password is out of date”, all you have to do here is Renter the Password you have been using or Change it to a new one. After that go to your Windows device and login to your Outlook account using the new password. There are many other tutorials out there asking you to delete or remove your Outlook account from your device and then install it again which is not a solution and also some mentioned the use of ActiveSync to login and solve the error code which is not working either. So do follow these steps and let us know if it was helpful and if you find any other way to fix this Error Code let us know so that we can update the post and it will be helpful to others facing the same issue. I changed the account server settings from ***-m.hotmail.com to eas.outlook.com and the problem was fixed.